Tire Sizing – Vermont Tire & Service Inc.
Tire Sizes and Ratings – What does it all mean? There is a lot of information written on the side of your tire. Below we decipher what it all means. If you are looking for tires, the first question you will be asked is what your tire size is. There are two places to find this information. The first is right on your tire. As you can see in the picture below, there will be a series of numbers and letters on your tire that will have a “/” in between the first number and the second two numbers. In our example, the tire’s size is P225/55R16. If you are interested, we explain below what all those numbers and letters mean. The tire will also have the brand name (e.g. Cooper or Michelin) and the tire model. This information will be important to have if you are not replacing all four tires because it is not recommended to drive on mismatched tires due to differences in performance that can affect driving. If you need just a single tire (as in the event of a irreparable flat) and you are unable to find the exact make and model tire as a replacement to match with your “still good” tires, our staff can help recommend an option that has similar handling characteristics to those you already have. You can also find your tire size on a sticker that is located on the inside of your driver’s side door. This sticker also provides you with the proper tire inflation pressure. If you would like to learn more about how to check your tire pressure, click HERE. 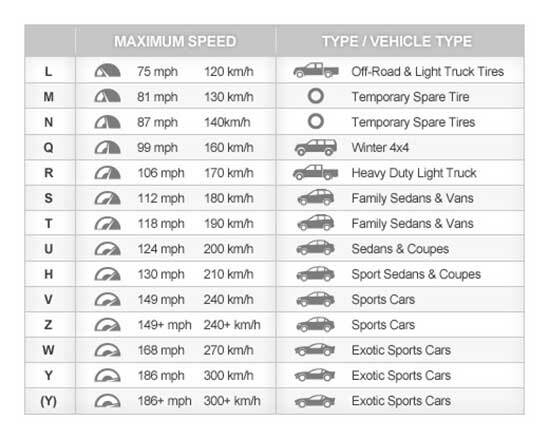 As you can see, the tire sizes are listed as front, rear, and spare. There are vehicles that have different size tires on the front and back. This is called a staggered fitment and it is commonly found on sports cars, especially on those with rear wheel drive. It is always good to confirm the size on each tire to be certain. The full description of this tire is P225/55R16 94V. * “P” designates that this tire is for passenger vehicles and is based on a set of US standards. You may also see an”LT” which would indicate a light truck tire. * “255” is the width of the tire from sidewall to sidewall. This is measured in millimeters. * “55” is the ratio of the height of a tire’s cross-section to its width. This is also in millimeters. For this tire, it would mean that the height of the tire from the rim to the tread is 55% of the width, or 140 mm. * “R” designates that the tire has radial construction. Pretty much all tires made today are radial tires. * “16” is the diameter of the rim in inches. * “94” is the load index. It is a numerical code that indicates the maximum load a tire can support when properly inflated. * Light truck tires may also have a load index. This is designated by a letter (A-N) that indicates a tire’s ply rating. The ply starts with A=2 ply and increases by 2 for each letter (e.g. B=4, C=6, etc…) Passenger tires are almost always a standard 4-ply, so the load index is assumed and is usually not written on the tire. * The M+S rating was developed in the late 80’s as the first attempt of standardized rating that would show if a tire could perform in the snow. This rating was based on a tread to void ratio and was soon shown to mean little as far as how a tire performed in winter conditions. To fix this, the Severe Winter Weather rating (which is symbolized by the mountain and snowflake symbol shown to the right) was developed and indicates winter passenger and light truck tires that meet the severe snow service requirements of both the Rubber Manufacturers Association (RMA) and the Rubber Association of Canada (RAC). * Uniform Tire Quality Grading or System, or UTQG, is a system developed by the government designed to provide consumers with information on tire treadwear, traction, and operating temperature resistance. A number, followed by two to three letters, identifies the grade on the sidewall. * Treadwear rating or grade is a comparative numerical rating based on the wear rate of the tire when tested under controlled conditions on a specified government test course. For example, a tire graded 200 would wear twice as well on the course as a tire graded 100. The rating increases in 20-point increments. It is important to note that the true performance of a tire depends upon the actual conditions of its use. Actual conditions may depart significantly from the test conditions due to variations in driving habits, service practices and differences in road characteristics and climates. * Traction Rating indicates the tire’s ability to stop a vehicle moving straight forward on wet pavement. The ratings are AA, A, B, and C, with AA being the best. * Temperature Rating indicates the tire’s ability to effectively dissipate heat. The ratings range from A to C, with A being the best. The DOT tire identification number indicates compliance with all safety standards established by the U.S. Department of Transportation and provides additional information about the tire manufacturer. Located on the sidewall of a tire, the complete DOT tire identification number is a combination of up to 12 numbers and letters that provide valuable information. The first two are the plant code where the tire was manufactured, and the last three to four numbers represent the week and year the tire was built. Tire retailers are required to report the DOT number for each tire they sell. This is usually done on a postcard which is sent back to the DOT so that you can be notified in case of a recall.